"Some of us know the difference a Fireteam makes. Some of us...we touch the Void. Make it a part of us. 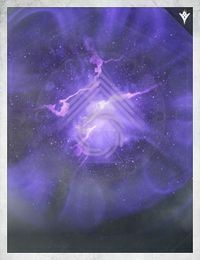 And then we take a name...Nightstalker. Hunt from the shadows, pin them down, never let them see you coming. " 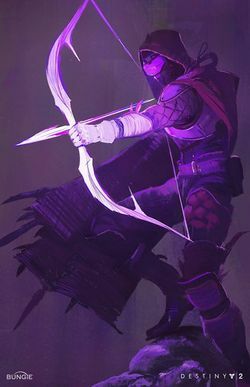 Nightstalker is a Void-based Hunter subclass. "Draw from the Void. Light the way." Vortex Grenade: Creates a vortex that continuously damages enemies trapped inside. Spike Grenade: Attaches to any surface and emits a damaging torrent of Void Light. Voidwall Grenade: Creates a horizontal burning wall of Void Light. Marksman's Dodge: Dodging automatically reloads your equipped weapon. Gambler's Dodge: Dodging near enemies recharges melee energy. High Jump: Upgrades Double Jump to reach greater height. Strafe Jump: Upgrades Double Jump with better directional control. Triple Jump: Upgrades Double Jump with an extra midair jump. Snare Bomb: Throw a smoke bomb that attaches to surfaces and detonates when enemies are near, slowing and disorienting them. Keen Scout: Gain increased sprint and sneak speeds, and an enhanced motion tracker. Tethered enemies are marked. Deadfall: Shadowshot's Anchors have increased range and duration, and attach to surfaces to wait for prey. Vanishing Step: Dodging makes you vanish for a short time. Vanish in Smoke: Throw a smoke bomb that makes you and nearby allies invisible for a short time. Lockdown: Grenade and smoke bomb effects last twice as long. Heart of the Pack: Killing tethered enemies creates Orbs of Light and increases Mobility, Resilience, and Recovery for you and nearby allies. Moebius Quiver: Shadowshot can be fired in rapid succession and deal bonus damage to tethered enemies. Flawless Execution: Scoring precision kills while crouched grants invisibility and Truesight. Shattering Strike: Hitting enemies with a melee attack after triggering Flawless Execution weakens then and reduces their damage output. Corrosive Smoke: Melee ability which throws a smoke bomb that explodes in a line, damaging and slowing enemies from afar. Spectral Blades: A stealth super which grants invisibility with Truesight when casted and gives the player two void daggers which deal massive damage.